The natural questions of How or Why in pre-dynastic times referred of course only to the immediately surrounding scene. The Libyan desert lay to the west, Sinai to the east. The Cataracts lay to the south and the sea to the north. Above was the sky and below the earth. The ancient Egyptians therefore saw their world as boxed within recognisable boundaries. The sky they believed to be held aloft at the four cardinal points by mountain peaks or pillars that rose above the range forming the edge of the world. The sky was a goddess, the mother-goddess Nut who supported the heavenly bodies and across which the Sun-god travelled each day. The earth was a god, Geb, through which flowed the great Nile river which was believed to rise from the eternal ocean in the south and join the eternal ocean in the north. Aware of their dependence on the land and their need to sustain themselves with agriculture, animal husbandry, fishing and fowling, the people of the Nile valley recognised their dependence on the benevolent radiance of the sun and on the rich annual flood. Two of the earliest religious cults were solar and nature. The former featured the Sun-god Atum-Ra as the Creator, and the chief protagonist of the latter was Osiris God. These two cults were combined into an explanation of The Beginnings. Some of the earliest myths tell of a time when Nun, the eternal ocean, filled the universe, which was a motionless watery void. When the waters subsided much as the Nile flood subsided each year, leaving pools and streams swarming with life a primeval hill appeared. It was on this hill that Atum-Ra the Egyptian Sun-god (according to the Heliopolis doctrine) created himself out of himself. Atum was the Creator who existed for all time; Ra was the Sun-god. Atum-Ra was, therefore, both the sun and the Creator, who was believed to sail across the heavens each day in a barge, not unlike the papyrus boats that travelled up and down the Nile. Atum-Ra Egyptian God had four children, all of whom he drew from himself. They were Shu and Tefnut, the gods of air and moisture, and Geb and Nut, the god of the earth and the goddess of the sky. Geb and Nut were at first locked together as one, but on the Sun-god’s orders, Shu, the atmosphere, came between them. He lifted the Sky-goddess to the heavens, leaving the Earth-god prone on the ground. Thus was described the watery void, a primeval hill, a Creator and the separation of heaven and earth. When the Sun-god crossed the heavens and cast his rays upon the earth, there was light. And when he The Country and the People entered the underworld at night it was dark and he delegated his power to Thoth, the Moon-god. Osiris God and Isis Goddess had a son, Horus. According to one version of the myth, when Isis and Nephthys prayed over the mutilated Osiris, his breath, hearing, sight and movement were restored and his seed entered Isis and she conceived. She hid herself in the marshes of the Delta until her son Horus was born. He was weakly at first Jbut she cared for him until he was grown and strong enough to avenge his father’s death. To rout out Set, his father’s slayer, Horus travelled far and wide and many and terrible were the battles between them told in countless myths; in one noteworthy clash Horus lost an eye which he later recovered and presented to his risen father, Osiris, as a symbol of his sacrifice. Horus finally triumphed over Set, took over the throne of his father and was regarded as the ancestor of the pharaohs. It will be noted that Horus and Set, who first appeared as ensigns on standards, are the protagonists in the mythological drama. They represent good and evil. Set, the desert totem, is cast in the role of the evil brother, and Horus, traditionally a totem of the clans of the fertile Delta, is cast in the role of the devoted son. The choice of ‘Horus’ for the offspring of Osiris and Isis is most significant. The hawk ensign, as we have seen, was carried to Upper Egypt by ‘Followers of Horus’ and had probably come to symbolise leadership. If, therefore, the Osiris myth was indeed devised to explain the benefits of Egyptian agriculture, the tale of the victorious Horus triumphing over the wicked-brother/desert-deity Set, would be assured of enthusiastic circulation in the centres of Horus worship in Upper Egypt. The uniting of solar and nature worship not only gave official sanction to widespread beliefs and reflected the ancient Egyptians’ most deeply-rooted concept of life after death, but established that Horus, the son of the nature gods Osiris and Isis, was also a descendant of the Egyptian Sun-god. The threads of two distinct cults thus woven together naturally led to contradictions but this worried the priests not at all so long as it brought the marvel of the creation closer, and so long as a solar god was victorious. The sun cult is apparent, in one form or another, throughout ancient Egyptian history. Its inception as a doctrine, however, cannot be accurately dated. 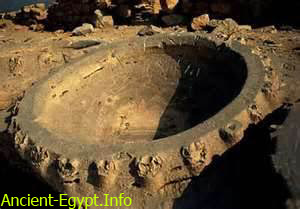 There is no evidence of its introduction in the first three dynasties, yet the political power of Heliopolis which became apparent in the 4th and 5th Egyptian dynasties (Chapter 3) could never have been so easily imposed or readily accepted had the cult not enjoyed a long and hallowed observance already. We can, fortunately, resort to relative dating, and here we are on firm ground. The Heliopolis Doctrine was established before the Memphite Doctrine, which only developed after the rise of Memphis.